As we’ve no doubt said many times here at Silke, we’re incredibly proud of our achievements and accomplishments. Despite being a family owned business operating in a market dominated by big businesses, we’ve managed to carve ourselves a more then modest niche as a provider of top quality, German-style modern kitchens, at very competitive prices and with phenomenal customer service to boot. Well, we’re very excited to say that yesterday, we won a very prestigious award in favour of those very achievements; the Cosentino Elite Honour! Starting in 2015, the Cosentino Group began it’s Elite Honours list, a program that selects a number of it’s officially recognised Elite Design Studios and rewards them for their fully embracing the prestige of the name. This includes remaining loyal to and expressing genuine enthusiasm in the brands under the Cosentino name; these include Dekton, Silestone, and Sensa; staying ahead of the game with business models, promotions, and warranties that are as beneficial to the client as they are the company, and generally going above and beyond what is expected of them in the name of excellence. The prize is nothing to sniff at either; representatives of the winners of this prestigious award (and their selected guests) were treated to a lavish meal, an evening of advice from interior designer Vanessa Brady OBE, and overnight stay at Le Manoir aux Quat’Saisons, Raymond Blanc’s two-Michelin Star restaurant and hotel. Needless to say, the Cosentino Elite Honour is not an easy award to win. 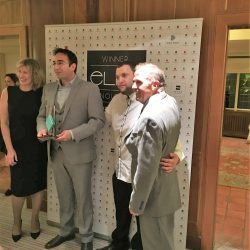 Only 18 Elite Studios out of the hundreds tied with the Cosentino group are selected as winners, and winning it requires a not insignificant amount of hard work on behalf of the Elite Studio. Our winning of the Cosentino Elite Honour is therefor nothing short of, well, an honour, and it’s one we wear with great pride. In a market where competition is fierce and keeping at the forefront of the developments within it is challenging, we think winning this honour says a lot about the quality of the service and products we provide, and the business model we operate under. Ah, but simply winning a Cosentino Elite Honour is one thing; uploading the qualities and values that lead to us winning the award in the first place is another. Well, thankfully, we also pride ourselves on two other qualities we haven’t mentioned yet; not resting on our laurels, and always standing up to a challenge. We intend to stand by the principals and practises that granted us this award, and will continue to provide the absolute best service for many years to come.